Christ Church Cathedral is the oldest religious building in continuous use in Indianapolis, built for the oldest Episcopal congregation in the city. This church is the only one remaining of the five major Protestant churches located on the circle during the Civil War period, at a time when the circle was known as Governor’s Circle. The building is also the city’s best example of early Gothic Revival architecture. Episcopalians came early in the city’s history. The parish of Christ Church built a simple chapel on this site in 1838, a year after the congregation formed. In 1857, the church hired Irish immigrant William Tinsley to design the present stone Early Gothic Revival church, which opened for services the next year. Tinsley had an active practice in Ireland before coming to the United States. He had several commissions under the church building program then active in Great Britain. Tinsley’s simple yet effective design includes dressed stone details such as the buttresses, plate tracery, and jamb moldings. In 1869, a spire was added to the tower. In 1900, the church selected W. and J. Lamb, with assistance from local architects Vonnegut & Bohn, to design the porte-cochere that extends to the south. The interior of the building has a plaster vault ceiling. In 1900, the congregation undertook a major alteration of the interior, including a new rood screen above the altar and a remarkable program of stained glass windows. Though confirmation is lacking, the windows are believed to be from Tiffany Studios in New York City. Regardless, the windows are masterpieces of turn-of-the-century glass work. Christ Church was once one of several large congregations with houses of worship located on Monument Circle. The church, now designated the Cathedral for the Episcopal Diocese of Indianapolis, is the only one left, still proud but dwarfed by its neighboring buildings. 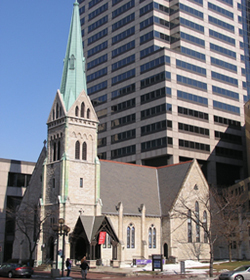 Christ Church Cathedral is located at 125 Monument Circle. The sanctuary is open to all during business hours and for Sunday services. The cathedral offers excellent free live music at various times of the year, including organ recitals and choral pieces, often aimed at the afternoon lunch crowd. Don’t miss the stained glass. Contact 317-636-4577 or visit the Christ Church Cathedral website regarding music schedule. Christ Church has been documented by the National Park Service's Historic American Buildings Survey.